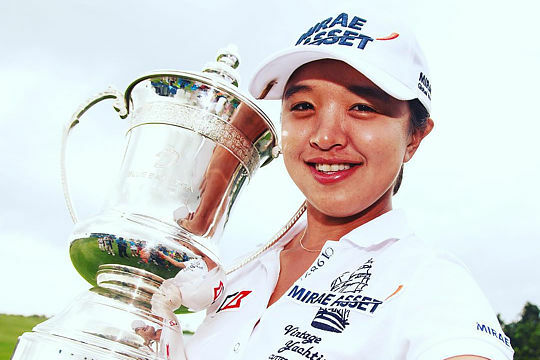 South Korean Sei Young Kim overcame the nerves of a tight finish against her ‘idol’ Stacey Lewis and Taiwan’s Candy Kung to win her 3rd LPGA title of the season at the Blue Bay LPGA in Hainan, China. The beautiful surrounds of the Jian Lake Blue Bay course belied the difficulties that players experienced during the week. High winds buffeted players throughout Saturday’s third round and despite conditions being calmer but damper on Sunday, only four players would finish below par. Kim was able to hold off Lewis, Kung and second-year player Kim Kaufman from the United States and enjoyed a slab of good fortune along the way, chipping in for a crucial par on the 10th hole after finding water beside the green. With Kaufman in the clubhouse at 1-under, Kim, Lewis and Kung came to the final hole all tied with her for the lead at 1-under. Each player pitched to within birdie range with Lewis first to miss her birdie attempt. She was followed by Kung who’s putt lipped out, leaving Kim to hold her nerve to hole a six-foot birdie putt for the title. Sandra Gal, Xiyu Lee and Alena Sharp shared fifth place at 3-over for the tournament. Kim’s first prize cheque for $300,000 lifts her to 4th on the money list with a season tally of $1,727,436. Despite her status as an LPGA rookie, only Lydia Ko and Inbee Park have won more events than Kim this year. Perth’s Minjee Lee was her usual consistent self, completing the tournament in an eight-way tie for 14th place after a final round 74 saw her finish at 6-over par. Karrie Webb returns to action this week joining Lee in the field as the LPGA completes its Asian swing at the Japan Classic.